During my seven-year stay in Japan as a college administrator, a lifetime interest in textiles led to a large collection of kimonos. 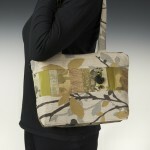 I wasn’t content to just leave them in drawers so I began designing garments for myself. Soon friends and strangers alike were calling upon me to share my creations with them. 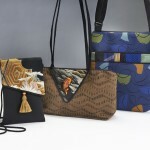 By 1995 I’d held several trunk shows which resulted in a showing at the US Embassy in Tokyo. As more people come to appreciate the beauty and history of vintage textiles, these treasured fabrics are increasingly scarce. Even for Japanese women of today, kimonos are family heirlooms, not everyday wear. 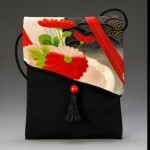 I feel that I’ve given the kimonos new lives as hand-crafted, handbags, scarves, ties and jackets. You can find my work in over 100 retail stores throughout the USA including the Smithsonian Art Museum and occasionally I particiapte in fine craft festivals in the midwest. 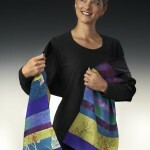 Kimono Designs by Theresa, Inc.